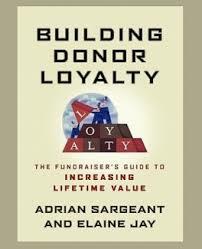 Building Donor Loyalty is a hands-on guide written for professional fundraisers that outlines the factors that drive donor retention, explains how to keep donors committed to an organization, and offers suggestions for developing donor value over time. It is based on data drawn from a research program which included more than 20,000 nonprofit organizations and was funded by the Aspen Foundation and the Indiana Fund through the Center on Philanthropy at Indiana University. Building Donor Loyalty contains a variety of illustrative case studies that demonstrate the power of effective donor retention strategies and clearly explains each of the factors that can build donor retention. It includes tools and techniques that have proven successful when growing long-term relationships with donors and offers practical advice for fundraisers who want to integrate this knowledge into their own thinking, planning, and practice.